As women, we are often expected to fill multiple roles: that of a loving mother, career woman, supportive wife or partner, volunteer in the community and, at some point for many, a new role—that of caregiver to our parents or loved ones. For the last 30 years, I have helped clients plan for their “golden years,” including how they will address the issues of aging and how to remain independent. I have recently experienced this myself; I was the Designated Daughter for my own parents. Because my parents and I had “the important conversations” and did the proper planning, I was prepared when I received that Call in the Night. Part of creating the life of your dreams is making sure you address all the what ifs in your life. Skipping this step can create unpleasant complications that can be avoided. Our parents and loved ones are living longer, and we need to know how this might affect our lives and be prepared with a plan. When Social Security, Medicare & Medicaid were designed, life expectancy was 63. 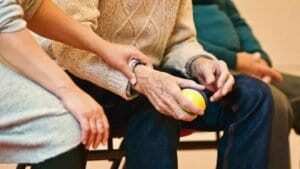 Our fastest growing population is age 85 plus and 50% may have some form of Alzheimer’s. By 2030, 70 million people in the US, or 1-in-5 people, will be age 65. Another 1 million people will be 100 years old. Learn how to be prepared, how to talk to your parents or loved ones, what you and they should do to ensure your lives continue to run smoothly, and how to avoid costly mistakes. Step One ~ Get Organized! Gather together the following items: One filing cabinet, complete with hanging file and manila folders; a copy of all important documents; a large three-ring binder with big tab dividers; and a colored marker. Use the binder to store copies of important documents. Label the document title on the tab divider. This will come in handy should you need to transport documents. Using your marker, write on the back of each document where the original is stored (i.e. Will store in safe deposit box at Chase Bank on 2nd and Main, son John has the key.) Have a section on beneficiaries that lists all documents with appointed beneficiaries. Always keep this section current. Next, organize your file cabinet. If you don’t want to store original documents in your file cabinet, note the original’s location in the appropriate file. Name and phone numbers of physicians, dentist, nurses, etc. Copy of statements for gas, electric, water, waste management, telephones, etc. Your documentation is organized. Breathe a sigh of relief! What are their wishes for long term care? What are their needs as they are aging and who can provide these? What kind of legacy do they want to create for themselves? It may take while to cover all of these topics. Don’t rush and feel as if you have to discuss everything at one time. their help to assess their situation and welcome their input on solutions. issues. Patience is key here! Most importantly, encourage them to really take a look at their values, lifestyle, and spiritual picture as they ultimately have to own the solutions. Next, you’re ready to select the individuals you want on the caregiving team. Include any that apply: family members, doctors, home care specialist, attorney, certified elder law specialists, insurance agents, brokers, CPA, caregivers, certified financial planner, therapist, etc. Many of these professionals are trained to help families deal with health, financial, and social issues in a holistic way. Analyze investments for quality, safety, income needs, tax situation, etc. Now that you have everything in place, sit down with your caregiving team members and develop a plan of action that satisfies your parents’ or loved ones’ goals, values, and objectives. The final product should enable them to maintain their dignity, lifestyle, and assets. In addition, the plan should be clear, concise, easy to manage, and tax-efficient. It should also acknowledge the needs of whoever becomes the main caregiver. The end result? Everyone involved is able to sleep at night knowing all concerns have been addressed and that a team and a plan is in place to accommodate all those what ifs. Join our free Smart Women Community with 1 Million others for resources, weekly ezine and radio show! What is Your Perfect Midlife? Use Your Past to Propel You Forward! Is Your Relationship with Money Healthy? Your new reality can’t begin until you do. Don't forget to download your FREE ebook ,The Five Biggest Money Mistakes Women Make and How to Fix Them! Plus receive immediate access to our Unlock Your Financial Power course, Radio Show Invitations, PLUS, 100 days of Inspiration! I promise I will never share, rent, sell, or trade your information.